As young men advance to Life Scout it is important that they, and their parents, prepare for Eagle Scout advancement. The process includes several steps including the Eagle Scout rank application and Eagle Scout Leadership Service Project. As district leaders, we want to assist you in making this process a positive and memorable one. The ESPA is an awesome opportunity to demonstrate all the skills a Scout has learned in Scouting. It is the time to take charge and shine! As stated in the Boy Scout Handbook, "While a Life Scout, plan, develop, and give leadership to others in a service project helpful to any religious institution, any school, or your community. (The project must benefit an organization other than Boy Scouting.) A project proposal must be approved by the organization benefiting from the effort, your unit leader and unit committee,and the council or district before you start. You must use the Eagle Scout Service Project Workbook, No. 512-927, in meeting this requirement. Contact your stake project approval team for ESPA assistance and to schedule approvals. If you do not know who to contact in your stake, please see this list. There are several steps that a Scout must take before actually sitting for the ESBR. Missing any of these steps can cause delays in the Eagle Scout award process. Obtain the required letters of recommendation. Please note, the letters MUST be mailed in sealed envelopes to your stake's Eagle Coaches and should be delivered prior to your board of review. After your committee and unit leader have approved and returned the application to the Scout, contact the District ESBR Team by e-mail to make an appointment for a board of review. All paperwork must be submitted to the District Advancement Committee at least three-weeks prior to the board of review date to ensure the materials are accurate and in order. Scouts should know the Scout Oath (Promise) and Scout Law. Scouts should wear a complete Scout field uniform (pants and shirt). All insignia needs to be in the correct places (see the BSA Insignia Guide), including merit badge sash. If a Scout does not have a complete uniform he may wear "Sunday best" dress. Scouts should be clean, well-groomed, and prepared to make his best impression. Parents and one unit leader are invited to attend to introduce the young man at his Board of Review, but will not be in the room with him during the review itself. 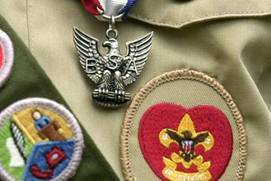 The Eagle Board of Review is not an examination; it is not a retesting of the skills a Scout has already demonstrated. It is a review. The ESBR will cover a Scouts entire Scouting career and he may be asked about any experiences since joining Scouting. Scouts may be asked for suggestions about how the program can be improved. Scouts will likely be asked questions about what they see ahead in their life. If you need to make an appointment for a Eagle Scout service project review and approval, to sit for an Eagle Scout Board of Review, or for any questions regarding the Life to Eagle Trail, be sure to contact the District Advancement Committee. Third Thursday evenings | 7:00 - 8:00 p.m. Remember packets are due three-weeks prior to your board.